Mangaluru: The City's first-of-its-kind 900 meter dirt track featuring three 'table-tops', and mounds of dirt piled up at a height, including 22 jumps- all set up at the newly created track near Kulur (behind Reliance Petrol bunk) did bring off-road riding back in vogue, during the Fifth Round of the National Supercross Championship, here in the city. It's a dirt bike racing track, alright. There were rows of mean machines, the sound of angry motors, bikers prepping to race, and a general air of speed and machismo. And the best part? Brad Ripple from Houston-Texas-USA, an American dirt bike specialist had also designed the 'technically demanding' track, which allowed the riders to jump at least 20 feet in the air. The event was full of sheer excitement and thrill, which gave the thrill-seeking bikers the feel of the dirt track, which is rare to find in a crowded concrete city. Due to lack of dirt tracks, I think this Supercross is a welcome development in a city after nearly 12 years, that had lost its reputation as a biker's hub to the tag of an educational city somewhere along the way. With urbanisation/infrastructure finding the right spot for an ultimate off-road experience remained a challenge until this day. "There are opportunities for four wheelers to do off-road racing because automobile companies organise rallies in many areas. But if one just wants to try off road biking for the sheer joy of riding and not to compete, there's no place to go. In the 80s, people rode on dirt tracks in their RDs, Javas and Bullets but they didn't have machines meant for the dirt track. Though many people would ride off-road, they didn't quite have access to the right machines. Off-road biking enhances the skills of a track racer, because they run parallel, pretty much. Usually track racers too start with off-roading races and develop techniques they will need for later years." said a local rider. Yet another local rider Sunder pointed out that in the West, like US, youngsters are exposed to the idea of biking at a very young age. But there is no such culture here . In the '90s, Bajaj launched the SX Enduro, along the lines of dirt bike styling. And recently, Hero launched the Impulse. But the manufacturers didn't consider how people could really test these bikes when there is no track as such," he added. On a dirt track, it's important to negotiate obstacles. People used to riding on a tarmac will find this challenging. "On a tarmac, the wheels are firm on the road, but in a dirt ride, the bike can just slip from beneath you. You need to get comfortable being uncomfortable. With a little bit of care and practice, this promises to be a fun ride' added Sunder. According to the organizers, "Motocross is a form of motorcycle sport or all-terrain vehicle racing held on enclosed off road circuits. Motocross is derived from the French, and traces its origins to British scrambling competitions. The name "motocross" is a portmanteau derived from the words "Motorcycle" and "Cross Country". Internationally Motocross is an outdoor dirt bike competition using long courses over natural terrain with some manmade jumps. It is seen as a family sport with parents assisting their young children teaching them the basics. Motocross involves racing in what are called Motos. More popular variants of Motocross include Supercross and Arenacross, which cater to professional racers, larger audiences, TV, and endorsements conducted inside a stadium. In India, Supercross is construed as motocross and vice versa as it has been the practice since the beginning ". Speaking to me, Shaina, aged 15, the only female rider from Mumbai in this Championship said, " I have been dirt biking for the last one year, and have one few consolation prizes. My brother, Ashwinder who is 13 also taking part in the "Demo Class" under 15 years category along with me. He is little better than me, but I want to beat him this time in this championship", she said with a smile, while her brother was listening to her close by. Shaina's dad, Sarvjeet Singh speaking to me said, " Although I am not a dirt bike rider, but I am a very enthusiastic fan of this sport. I have fully supported my daughter and son in this sport, and want to see them excel to the top in this supercross and other motocross/dirt bike events". Shaina who took part in today's event came in third place in the 'Demo Class' under 15 years category. The National Supercross championship was inaugurated by Ministers Abhayachandra Jain, U T Khader and Police Commissioner Hitendra- Prior to the inauguration, UT Khader bringing back the spirit of his teenage days rode a TVS RJR180 FX motorbike all along the track to the loud applaud of the crowd. Brad Ripple, the American dirt biker also enthralled and wowed the crowd by demonstrating some amazing and superb ride stunts, which created some sheer excitement among the other riders and lovers of this sport. Nearly 120 professional and amateur riders from Delhi, Punjab, Nashik, Mumbai, Chennai, Coimbatore, Bengaluru, and Puneare taking in this event, including 25-30 local riders (Mangaluru/Udupi) are participating in the �locals� category. 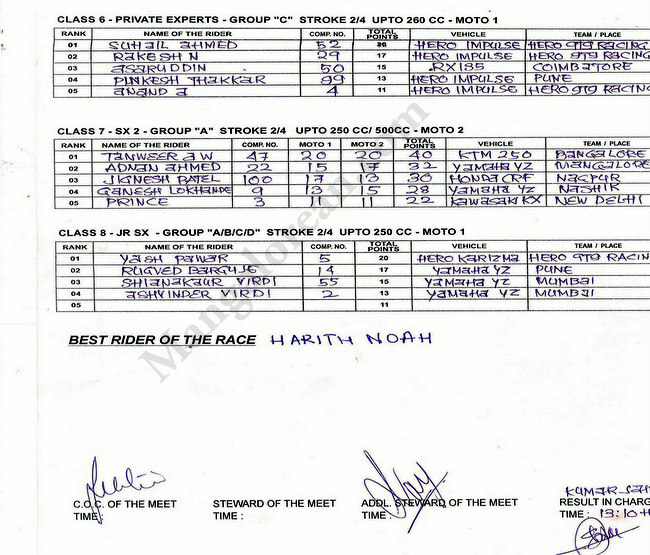 But sadly, the two-time National Racing Championship winner, Arvind KP, from Udupi will not take part today due to a thumb injury.There are seven categories in this championship namely Junior (under age of 15), junior expert class, India Expert Class, Private Expert Class, Novice Class, and Local Class. Prizes to the winners will be distributed this afternoon, while the final sixth round of this championship will take place in Bengaluru on 29/30 November 2014. This National Supercross championship was organized by Godspeed Racing-Pune in association with Mangalore Motocross Sports Association, and sponsored by MRF, TVS, Hero, and Servo. The event was compered by Chivas of Godspeed Racing-Pune.